Spread the Love Spotlight — Christina of GorgeousBaby Canada! In this series we are introducing you to our wonderful retailers, the amazing women who are helping us to make the Spread the Love benefit a reality. Please welcome Christina from GorgeousBaby in Canada (don’t miss Christina’s own line of beautiful pouch slings on her site!). Tell us about a typical day in the life of Christina. I do my GorgeousBaby work from home while taking care of my 4 year old and 21 month old…so work is done in little snippets: answering emails over breakfast, phone calls & shipments packaged over naptime. My husband is very helpful and takes the children out of the house most every afternoon which provides an hour of earnest work. I usually am thinking of business from the time I wake up until we sit down for a late supper….and then I’ll be checking my blackberry for orders, etc until bedtime. Back to Kauai! Haven’t been back since our honeymoon, and we’d love to share the experience with the wee ones. Being from the westcoast of Canada, the thought of warm water swimming is pretty dreamy. If you won the $100 giftcard to your own store, GorgeousBaby, what would you get and why? Oh, how to choose a Sakura Bloom? I LOVE the softness of Spice and yet Storm is so classic…probably Storm! Where can you find Christina online? Blogging about her awesome baby carriers at the GorgeousBaby Blog. You can also keep up to date with the latest happenings at GorgeousBaby by fanning them on Facebook or following along on Twitter! Welcome to our first installment of Sakura Bloom’s Men In Slings! Our first father is Marco from Fremont, California, pictured here with his beautiful daughter. We love how comfortable they look, his daughter’s sweet polka dot pants, and that West Coast foliage in the background! What is your favorite thing about a ring sling? This is a bit selfish, but I love the freedom and independence it gives me. I’m able to do things without lugging around a huge stroller or worrying about accessibility. Describe the moment you *got* it. My wife has worn our daughter from her second week of life, so I’ve always seen that she was happiest that way. At first we had a Bjorn, but it pulled on my shoulders. I used it for a bit and then my wife did a lot of research and found out that Sakura Bloom ring slings are much more ergonomic and enjoyable. So after many conversations and trying out her slings, I got a Sakura Bloom of my own. 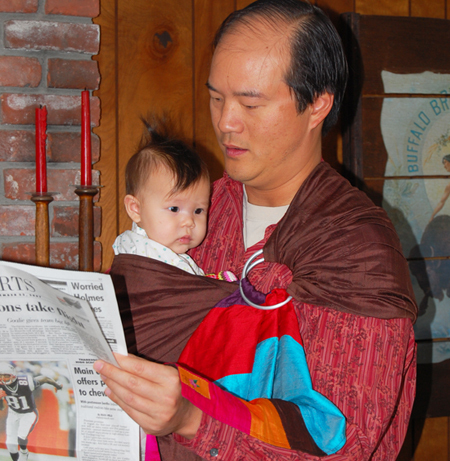 What do you wish other fathers knew about baby slings? I wish other fathers knew how wearing your baby helps you to carry on doing the same things you did before you had the baby. I think a lot of dads think they’re stuck on the floor playing with their kids without being able to do anything else. I do chores, I am on the computer, I cook, I work on the garden, and I know exactly where my daughter is. Although we own several Sakura Blooms, there is one that is just mine: its a Storm Simple Linen. What do you use your sling for most? I use it to put my daughter to sleep at night. When she’s really fussy and in a mood, cradle carry and a song puts her to sleep in 10 minutes!